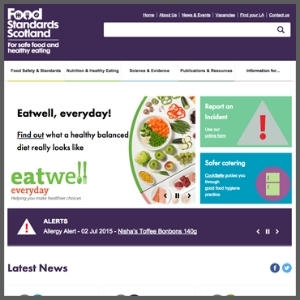 Website copywriting for Food Standards Scotland. I helped a new government agency to establish its voice online. Food Standards Scotland was a brand new government agency, taking over from the Food Standards Agency. So they needed a brand new website, with content merged from no less than four different sites. Once the structure was in place, all their web copy needed to be edited to have a consistent tone of voice, appropriate for a number of different audiences. Tall order. But I wrote it on budget, and on time.